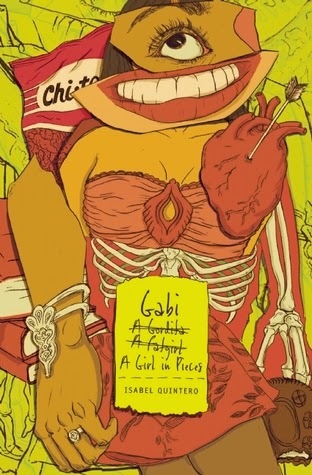 Gabi: A Girl in Pieces by Isabel Quintero. Grades 9+ Cinco Puntos Press, 2014. 284 pages. Review copy provided by my local library. I'm so thankful for dear friends like Kelly Jensen and for awards like the Morris Award because I wouldn't have picked this book up on my own (the cover scares me a little) and then I would have been MISSING OUT. This fictional diary of Mexican-American high school senior Gabi Hernandez is so real that I could have sworn I had picked up the actual diary of a seventeen-year-old girl. It reminded me of writing in my own diary when I was in high school (much less eloquently, of course), and I don't at all mean that it feels like Gabi's writing in the '90s. I just could really identify with Gabi and the questions that she has and her thoughts about relationships and friendships and family. The masterful thing is that I don't have anything in common with Gabi, actually. She's a Mexican-American teen dealing with a lot of issues that (thankfully) I never had to deal with in high school. And yet, I feel like she could have been me as a teen. I also kept thinking about Mattie Gokey (one of my literary BFFs) and Anne Frank. Like, seriously, Gabi is so easy to identify with and root for. I didn't want the book to end, and that's probably the biggest compliment I can give (I LOVE finishing books). This is probably not making much sense. I'm gushing, I know. Let's see... Gabi is dealing with a lot of issues. Her dad is a drug addict and hardly ever around. Every now and then he'll try to change, but he's always relapsed. Gabi has two best friends - Sebastian who has just come out to his parents and is now kicked out of their house, and Cindy who has just become a statistic - another pregnant teen. Gabi wonders if all of these problems will keep her from following her dream to go to college. She starts taking a poetry class and falls in love with writing poetry. She's a talented writer with lots on her mind. This book was just a pleasure to read and I want to make sure you don't miss it. Honestly, the cover scared me a little bit, although once I read the book I could see where it came from - it has to do with a zine about body image that Gabi creates during her senior year. Sigh. You should probably go read a real review of this book, like the one over at Stacked. I'd hand this to teens who like reading about characters they can identify with, teens with questions about romance and life and friends, especially teens who appreciate the honesty of Anne Frank's diary. What an Amazing Newbery Year!